As you can see Callie has her hands full, which is why she hires a local lawyer named Lana Campbell, to help her sort things out, but they have to battle against Doug Cullen, who happens to be Callie’s brother and who is dealing with a serious case of survivor’s guilt whilst trying to protect his mother because he can’t believe that Callie is his sister. Thankfully Lana and Doug hit it off immediately and thus begins a lovely secondary romance between those two. This book has a lot of characters and they were all appealing in different ways. Callie was your typical tough Roberts’ heroine (I must admit that Roberts is a bit formulaic and her characters usually reflect this) and she was well-balanced by a more laid-back hero. This is an author with a great eye for chemistry and fantastic couples and this book is no exception. I enjoyed the love story a lot and I was happy to see them overcome their issues and move on as a more stable and mature couple. The secondary romance was just as good and it didn’t hurt the main couple or took away the spotlight, but it was just as sweet and fulfilling as Callie and Jake’s was albeit in a whole different way because Doug and Lana couldn’t be more different couple. This book is quite long but is an effortless read. There are many things going on, including murder attempts, actual murders, arson, secondary love stories that are just as engaging as the main one, lots of relationship drama, and a very charming main love story. The archaeological aspect of the plot was fairly well done, obviously in a real dig -and you don’t need to have a degree to realize this- no one has time for that many intrigues, the work isn’t as romantic as popular culture often portrays it, there’s a lot of hard and detailed work involved, and by the end of the day everyone is so tired that there’s no time for machinations, murder plots and rekindling a flame between lovers (well, unless you have a bunch of students then there’s always time for that). This is a story about second chances. Callie and Jacob love each other very much but they rushed into things and their relationship suffered from it, now they need to overcome those issues and figure out how to make it work. Then there’s Lana’s second chance at love, she never thought that she would be able to find love again after losing her husband but fate brings her Doug. And finally we have Suzanne’s second chance at having a relationship with her long lost daughter. So as you can see the theme of second chances and missed opportunities is present throughout the story and in each one of the main characters. 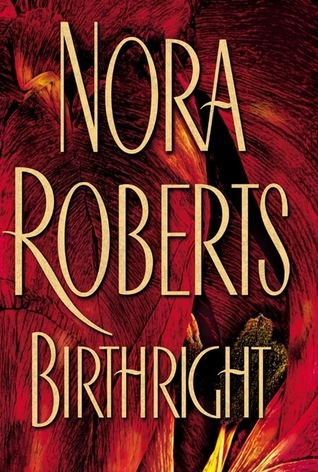 In my humble opinion this is one of Roberts’ best books, it isn’t my favorite, but I think that every fan of romance would love it and if you are new to the genre or unfamiliar with this author, Birthright is a good place to start. 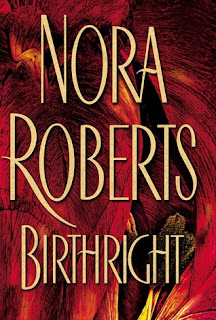 A rich, thrilling, suspenseful tale, Birthright follows an inspiring heroine, an intriguing hero, and a cast of fascinating characters whose intertwined lives remind us that there is much more going on under the surface than meets the eye. Jacob Greystone...LOVING the name! I've really been meaning to get into a good NR book. I'll have to grab one of my mother's soon since she comes so highly recommended by you. I love that the heroine is an archeologist..that's a bit different. I'm looking forward to reading one of her books sometime soon. The name is awesome and the guy is dreamy! If you're new to NR you have to start with Carnal Innocence first, that book is sooooooooo good, Marie reviewed it last year in case you want to check it out. Can't wait for you to finally read her books! I absolutely loved this book. I actually read it in paperback years ago, but came across a hardback copy and snagged it. I must have read it 8 times. Still remains one of my favorites. Hi Trish! It's good, isn't it? The same happened to me with Carnal Innocence, I reread that book all the time and I'm not much for rereading books, even the ones I love.